The theme of the month at Nikon's Birding Optics page is digiscoping- check out the digiscoped bird pics slide show that plays when you open the page! There's also a link to a nice little digiscoping video on the bottom of the page. And some guy you may have heard of is the featured ProStaffer of the month, too! I took a nice little birding trip to the Chico Basin Ranch after work on Friday, spending the night and then birding a cool Saturday at this well-known Colorado hot spot. 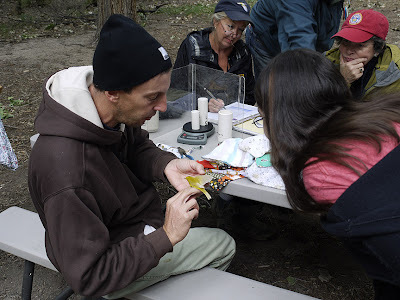 Besides birding, I enjoyed catching up with friend and fellow Nikon Birding ProStaff member Brian Gibbons, who is running the banding station there for the Rocky Mountain Bird Observatory this fall. It was a busy day at the nets, with nearly 100 birds banded. Wilson's Warblers led the tall, and among them was a very unusual one that was mostly lacking melanin pigmentation. In birding circles, individuals like this are usually known as leucistic, although the condition may also be called dilute plumage. 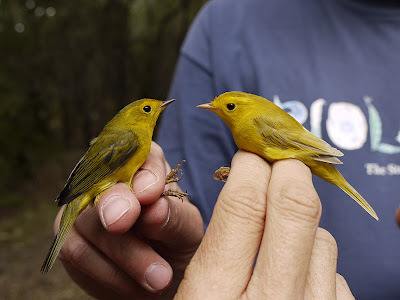 On a normal Wilson's Warbler melanin pigments darken the cap, wingtips, tail, bill, and legs. Yellow coloration is from caroteniod pigmentation, derived from plants instead of synthesized by the bird. 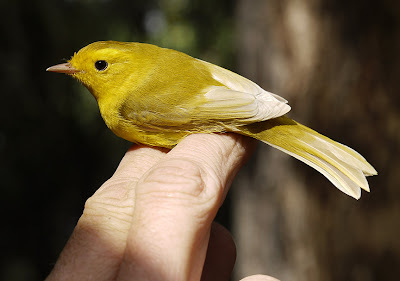 The olive-greenish back of a normal Wilson's Warbler is from a mix of melanin and caroteniod pigments. So when most of the melanin isn't present, you get a bright yellow bird like this one, with very pale wingtips and tail, a yellow back and cap, a pink bill, and pink legs. 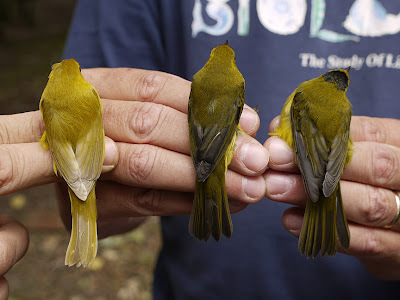 When compared to normal Wilson's Warblers (hatch-year female, left, & male, right), you can see the effects of having normal melanin vs. greatly reduced melanin. 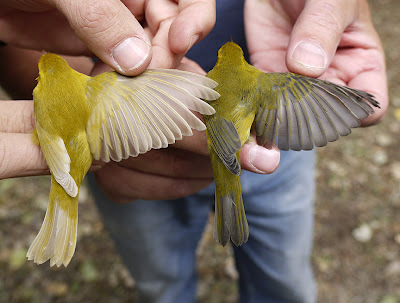 Below are a few more comparisons vs. a normal hatch-year female.